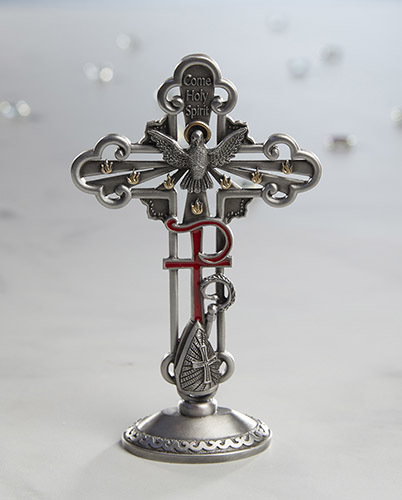 Beautiful Confirmation Cross makes a wonderful Keepsake Gift! It stands 6"H and features a Holy Spirit Dove with a gold enamel halo. Beneath the Dove are seven gold enamel flames representing the Seven Gifts of the Holy Spirit. Near the base of the cross is the Bishop's Mitre and Staff. A red enamel Chi-Ro representing the name of Christ stands at the center. Silver plated. Gift boxed.